(Bloomberg) -- R. Thyagarajan, founder of Shriram Capital Group, said the Indian company is getting close to merging its listed units, a move the firm hopes will help the non-bank financier boost its lending and insurance businesses. Shriram Capital, which counts billionaire Ajay Piramal and private equity firm TPG as investors, is considering combining with its publicly traded units Shriram Transport Finance Co. and Shriram City Union Finance Ltd. The transaction will result in the holding company getting listed, Thyagarajan said. No timeline has been set, he said. The deal will give TPG, which has been an investor since 2006, and Piramal an opportunity to exit. Piramal Enterprises Ltd., which bought TPG’s stake in Shriram’s transport finance unit in 2013, tried and failed to combine the Chennai-based group with IDFC Ltd. two years ago. 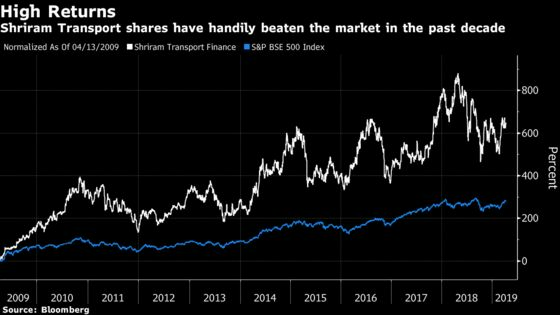 Shares of Shriram Transport, which offers loans for new and pre-owned trucks, have surged ninefold since 2006. They rose 1.5 percent in Mumbai on Monday. Shriram City, which gives credit to people to buy consumer good and motorcycles, dropped 2.5 percent. Thyagarajan, who started his business in 1974 to help friends earn a steady income, said the group’s association with Piramal has been “pleasant,” adding that Piramal helped bring McKinsey & Co. advisers to help the lender improve its practices. The group will be “happy” if Piramal continues as chairman even if the billionaire decides to exit or reduce his investment in the lender, Thyagarajan said. Once the merger is complete there will be one company in the business of lending to truck buyers and consumers, Thyagarajan said. Insurance businesses will remain as subsidiaries under the lending business, he said.